As so much of the shopping available in cities and towns becomes a clone of all the other high streets, why not escape to the North Norfolk Coast and enjoy wonderful independent retailers, big skies, wide open spaces and room to breathe. Our Top 10 Reasons for shopping at Dalegate Market this half term. 1. 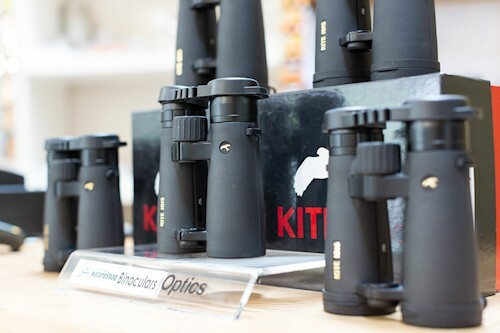 One Stop Nature Shop offers wildlife watching equipment, including binoculars, telescopes, trail cameras and so much more. They’ll even help you find the wildlife to watch, directing you along the North Norfolk Coast to see the latest visitors. 2. Relish is an accessories and jewellery boutique, a treasure trove that needs discovering. Spend a few minutes in this shop just taking in the range. Please ask if you need help as Julie and her team can help style you. 3. 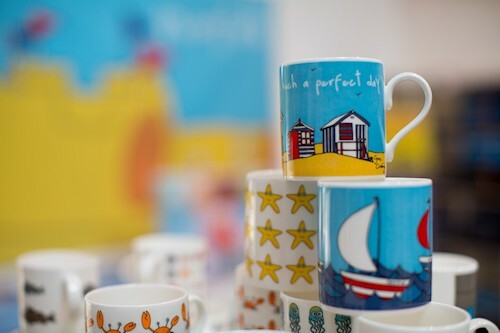 Gone Crabbing have a wonderful range of Norfolk inspired clothing and souvenirs. Clothing for the children and big kids in your life, plus those special items to remember your holiday or thank your pet sitter. 4. The Hare & The Hen, a gallery of beautiful art and crafts, from many local artists. 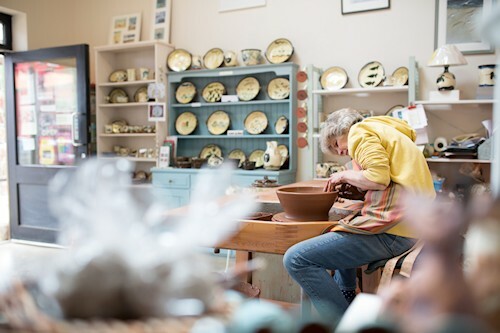 Philippa creates her wonderful pottery in the shop, with many pieces on sale and bespoke orders welcome. 5. 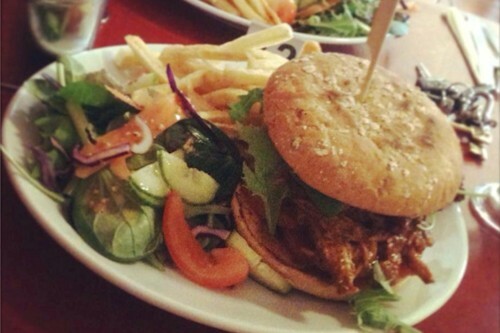 Keshco's is an independent supermarket, offering all the usual groceries with local products and off-licence. One of the few petrol stations along the A149 coast road. 6. Pop Up Shops from Thursday 23rd to the following Tuesday 28th October in our beach huts. 9. Winter Lunches and Sunday Roast Lunch at Deepdale Café – Including Brancaster Staithe mussels, soups, sandwiches and other delicious dishes. 10. Fat Face, which we know isn’t an independent retailer, but is a lovely shop offering clothing & accessories. Oh, we might need to add a very important 11th reason. 11. Free Car Parking, the Coasthopper bus service drops right outside the door too. The North Norfolk Coast has space to pause, breathe and relax. Opposite there is St Mary’s Church, which is well worth a visit – The stained glass, Norman font and Saxon round tower are the highlights. Can you find the face in the moon or the months of the year carved in stone? There is a great Circular Walk, which takes you from Dalegate Market round Brancaster Staithe, across Barrow Common and back along the Norfolk Coast Path – Great views! Deepdale Bike Hire offers a range of bikes for all the family for hire by the hour, day or week. The Norfolk Coast Path heads West towards Hunstanton and East towards Burnham Overy Staithe, Blakeney and beyond. Hop on the bus back. Longer term car parking available in the layby opposite Dalegate Market on the A149. Why not turn your shopping trip into a short stay. Deepdale Backpackers & Camping next door offer private ensuite rooms, family rooms, camping for tents & campervans, and the glamping in tipis, yurts & shepherds huts. We look forward to seeing you this October Half Term, but remember that independent traders are for all year, not just holidays, and our lovely shops are open all year around. So you can use us as an excuse to visit this beautiful part of the world throughout the year.